The 2019 First Flush Dragon Well is the finest and freshest Dragon Well available. Harvested at the very beginning of the Spring harvest and before the Ming festival, this Dragon Well is in very limited quantities. The First Flush Dragon Well is also know as "Head" tea as it is the first and best of the season. 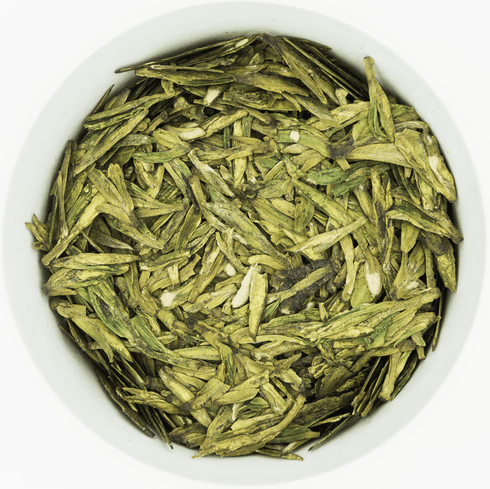 The tea leaves are a bright spring green color and the tea has a pale green color, fresh taste with roasted undertones, and a clean aftertaste. A steeping time of 1 to 2 minutes with about 70�C/160�F water is recommended, with an additional 15 seconds for each successive infusion. Use about 1 tablespoon (3 grams) of tea leaves for about every 5 ounces (150 ml) of water. This tea may be infused 3 or more times. The use of a covered glass or ceramic cup is recommended for steeping in order to fully appreciate the tea leaves. � 2019 Copyright Ten Ren Tea Inc., All Rights Reserved. Certain descriptions on Ten Ren Tea website used by permission from Ten Tea Inc.